LISLE, Illinois (June 19, 2017)— The Chicago Region Tree Initiative (CRTI), a coalition of leading Chicago region environmental organizations led by The Morton Arboretum, has unveiled a new resource offering a never-before-seen analysis of the Chicago region’s tree canopy. Led by researchers at The Morton Arboretum, the US Forest Service, and The Field Museum, the data set is the most comprehensive of its kind in the country to offer a holistic look at the value trees bring to our region, by layering canopy data with median income, minority populations, temperature mapping, health data, and air quality. The resource, developed using LiDAR technology combined with aerial imagery to map the canopy from above and pulling together various data sets, offers more than 284 Chicago-region municipalities a unique look at their city’s treescape. Found at chicagorti.org, the information will also help communities pinpoint opportunities for improvement – including where trees can help reduce heat islands, benefit vulnerable populations, impact real estate value or better the health of a community. CRTI designed this resource to identify Chicago area communities in most need of help, to help communities more clearly understand the myriad benefits trees make to their city, and to empower cities to take steps to improve their tree canopy. “We saw that there was a gap in knowledge, time and funding, which makes it especially challenging to persuade cities to focus on trees,” said Lydia Scott of The Morton Arboretum, who serves as the director of CRTI. “With this new resource, CRTI is better equipped to help cities work together, helping them understand that trees are a critical resource that provide value beyond the boundaries of where they are planted. “Now that we have an inventory of our region’s tree species, our cities can think more critically about what tree species to plant for the future,” Scott added. There are 157 million trees in the Chicago region. Our region’s trees provide $51 million in tangible benefits, including cleaning our air and water, reducing flooding, improving property values, and bettering residents’ health. 60 percent of the seven-county Chicago region’s trees has fewer than 10 species. Nearly one third of those trees are invasive species: the invasive European buckthorn is the most abundant tree in the Chicago region, covering 30 percent of the area. The greatest opportunity for increasing the area’s overall canopy exists on residential land, followed by transit corridors. Urban heat islands, the hot spots in cities created when buildings, sidewalks and parking lots trap nighttime heat, are lower in communities that have higher tree canopy, while tree canopy tends to be lower in underserved communities. Dolton, Glenview and Riverside were among the first to work with the CRTI resource. With the data, Dolton learned it had potential to double its tree canopy, which could improve the city’s air and water quality, reduce flooding, reduce crime, and potentially, improve residents’ health. CRTI assisted them in developing a partnership with Ball State and DePaul universities to help them with a tree inventory, the first step in helping create a more valuable tree canopy. 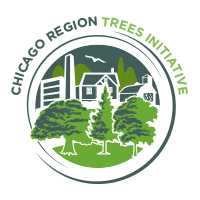 Established in 2013, the Chicago Region Trees Initiative (CRTI) is a collaboration of Chicago-area organizations working together to build a healthier and more diverse urban forest by 2050. Led by The Morton Arboretum, it is the largest such initiative in the country, with leading national, state, regional and local agencies from working together to expand the understanding of the value of the region's trees and to make meaningful tree and forest improvements in the region. For more information, visit chicagorti.org.